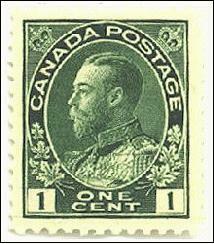 Although George V succeeded Edward VII as King of England and the British Dominions on 6 May 1910, stamps depicting his reign were not issued until the latter part of 1911. The ensuing period, lasting until 1928, has become one of the most studied areas of Canadian philately, which is remarkable considering that, during all those years, except for the 1917 issue commemorating the 50th Anniversary of Confederation, only one basic stamp design was in use. This was due to several reasons, not the least of which was Canada's active participation in the First World War from 1914 to 1918, which caused a scarcity of both craftsmen and materials needed to design and manufacture stamps. The main fascination over this issue centres around the seemingly endless number of ways in which it may be collected and classified. Changes in monetary exchange rates as well as international postal rates after the War caused new denominations to be issued, as well as a change in colours. The long issuance period required new dies and numerous plates to be struck, resulting in an enormous range of flaws and other varieties for collectors to study. Lastly, in the second half of this period, two important manufacturing innovations came into existence: a faster printing process using pre-gummed dry paper and life prolonging chromium facing for printing plates, both of which resulted in stamp varieties that are visible to the eye. This first Canadian Georgian issue, therefore, is of immense interest to philatelists, and this publication is dedicated to furthering its study. feedback on this publication. Information pertaining to errors and omissions, helpful suggestions, and offers to provide additional material, etc, are more than welcome. All rights reserved. No information contained within this publication, including its internal hyper-text links, is to be used for financial gain without the expressed, written permission of the authors.